Reports allow you to create/view snapshots of particular areas of your business. Deputy has a Reports system that helps collate different information about the company. Note that only System Administrators and Location Managers can access the Reports tab. We’ll walk you through what you can do in the Reports tab. From the Reports page you can track many important details regarding your staff's performance, including their availability, rostered hours, journal history and personal details. Note that at the top of each report is a Printer icon, in case you would prefer to have physical copies for your records. We’ll walk you through what each of these means. The Employee Details report shows basic information about each employee, including work locations, birthdays, age, tenure, contact details and activity. After running the Report, each section can be accessed by selecting the relevant checkbox. Journals are entered when approving employee timesheets. This can give you an overview of some of your more outstanding employees in case of some well-deserved recognition. It can also be used to see areas of improvement and training. After running the Journal Usage Report, you will be able to see the total number of journals in the selected time period, sorted by manager, category, and employee. Clicking the name of a manager will show the journals by that manager. Similarly, selecting an employee's name will show the journal entries about that employee, and selecting a category will display all journal entries of that category. For more information about this feature, check out our Custom Report Builder [BETA] help doc. 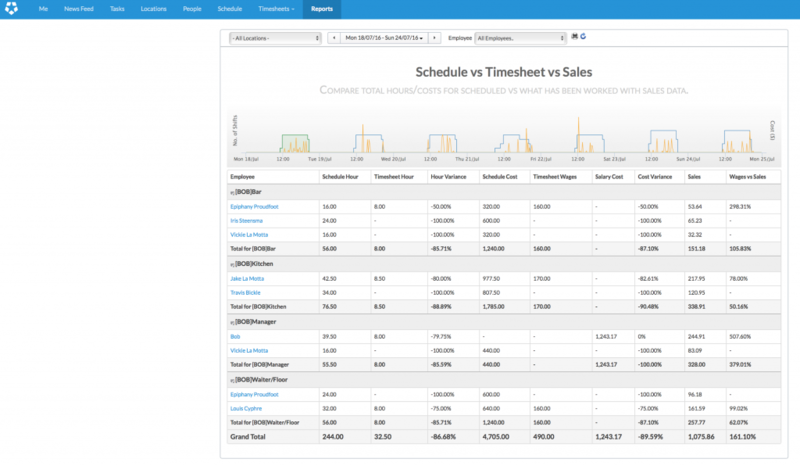 The Schedule vs. Timesheets vs. Sales report will allow you to compare your total sales in a given period versus the rostered hours of your employees, shown against the hours that they actually worked. In the short overview on the Reports page, you will be able to see a graph displaying the data from your last week. The blue column shows the total number of rostered hours, the green shows the number of hours actually worked, and the yellow line shows your sales data. 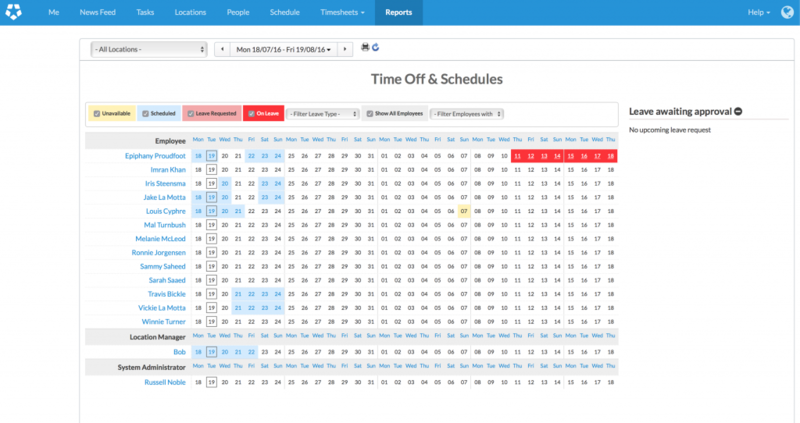 The Schedule vs Timesheet vs Sales report will populate the sales section from the data you input in the 'Sales Budget' section on your scheduling page. 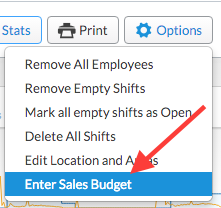 To enter sales data, navigate to the Schedule page and in the top right, click the 'Options' dropdown box, and click 'Enter Sales Budget'. When you click this, you can enter your daily budget in the ensuing box. This report will display a range of dates of your choosing, and will display whether employees have dates in which they have approved leave or are unavailable. Displayed on the report will be your employees' unavailability, leave awaiting approval, approved leave, and scheduled shifts. If you click the "show all employees" button, all staff who have relevant information within your selected time period will be shown.